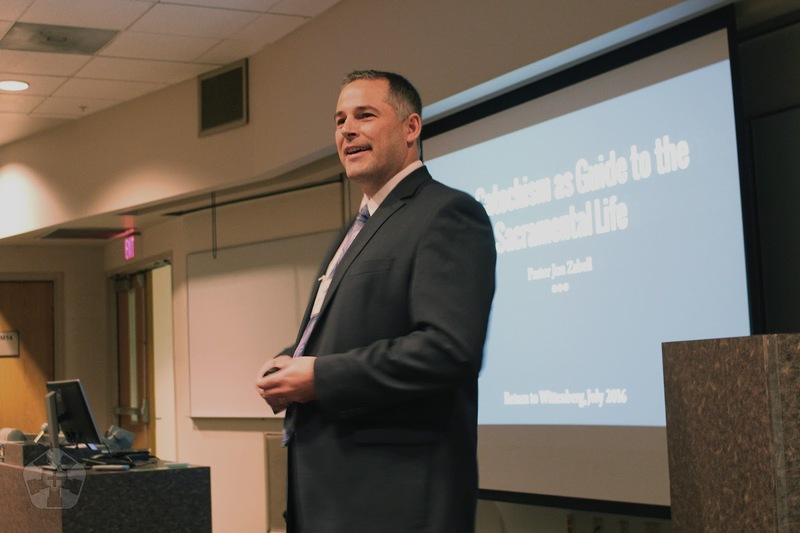 This past week I was privileged to be a part of the first Return to Wittenberg (R2W) conference, entitled “What Does This Mean?” The event was held at Wisconsin Lutheran College in Milwaukee, on July 26-29. Since this was the event’s debut, I’ll spend a little time explaining what R2W is before reviewing my experience. Last fall I was invited by several WELS pastors and laymen to consider presenting at the conference and help with the planning. Much of the groundwork had already been laid, so I can’t claim to have contributed much more than a graphic identity. 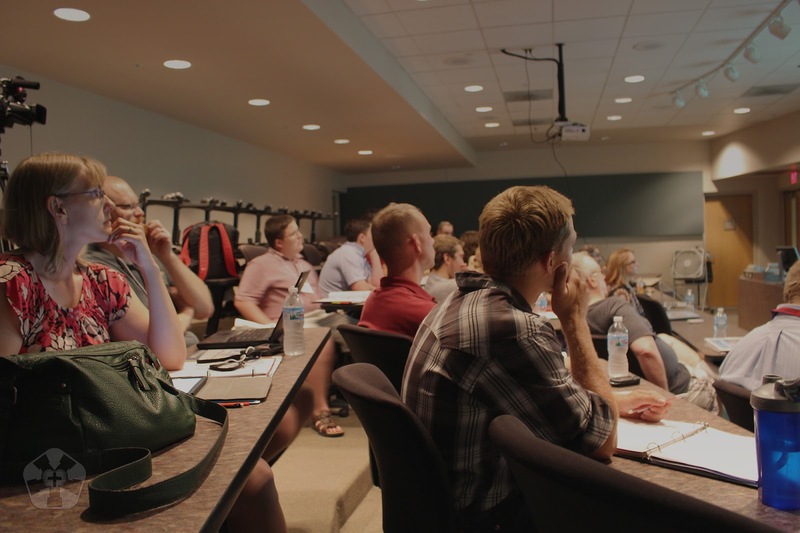 In the early planning stages, the conference was conceived of as an alternative to WELS youth rallies that would be recognizably Confessional and Lutheran. While that may be the easiest way to explain it, it would be an oversimplification to say that R2W is just a WELS knockoff of Higher Things. What it became was a conference focused on the catechism, aimed at teens through 30-somethings, with the intent that all ages would be welcome. What a conference on the catechism might look like, I had no idea. And although I try to be more involved in Lutheran doctrine and practice than the average layman, I have to admit that it didn’t sound all that exciting. There weren’t really any hot-button issues on the docket, and the only session that intersected with my area of interest was the one I was presenting. I decided I would hope for the best, and take it in stride if it didn’t live up. I’m happy to say that my reservations quickly evaporated. The plenary sessions were meaty, yet engaging and even enjoyable. The plenary speakers (Pr. Johann Caauwe, Pr. Nathaniel Seelow, and Pr. Jon Zabell—pictured left) were all well practiced in their material. The catechism was presented as a guide to Christian living in every area of life—as opposed to a systematized book that will get us through confirmation, but which has little else to do with us. It made me see the Lutheran faith through new eyes. Often-glossed-over areas of the catechism were expounded upon and given a renewed importance, such as private confession and absolution. It’s surprising how many things we tend to think of as being “Catholic,” but which are actually viewed as a necessary component of the faith in Luther’s catechism. In short, Lutherans who endeavor to make the study of the catechism a life-long process will find an inexhaustible wealth of wisdom and guidance, as opposed to studying the scriptures alone. One of the unexpected advantages of having a small conference (around 40 attendees) is that there was plenty of productive discussion during the sessions. There were four sessions on each full day of the conference, and a panel discussion on the last day. It wasn’t strictly lecture-format, as is typically the case at larger events. Because we all went to the same sessions (there were no break-out sessions), there was a kind of camaraderie that developed between the attendees. The worship services formed the backbone of R2W, and they were quite refreshing. The opening service featured a processional cross (Pr. Luke Boehringer pictured at left), which I rarely see outside of worship conferences. There was kneeling, making the sign of the cross, and the singing of wonderful Lutheran hymns—some of which rarely see the light of day (e.g. the Lutheran “Kyrie,” “Isaiah, Mighty Seer,” and Luther’s “Wir Glauben All in Einen Gott”). Daily offices included Matins, Vespers, and Compline. Liturgical responses that are often read in the WELS were chanted. All of this took place in the WLC chapel, which (I just learned) was originally built as a convent. Arched ceilings, marble paneling, ornate columns, and stained glass provided a beautiful space in which to gather around the Word and sacraments and proclaim God’s wonderful works through song. I think what distinguished worship at R2W from the WELS Worship Conference is that R2W pulled out very little material that would be unfamiliar to someone who uses Christian Worship: A Lutheran Hymnal. In other words, while everything is done very well, it is still attainable at the congregational level. There isn’t anything that a good cantor, organist, and small choir can’t pull off. That’s the beauty of Lutheran worship: it doesn’t require a professional choir, virtuoso soloist, or a variety of instruments. 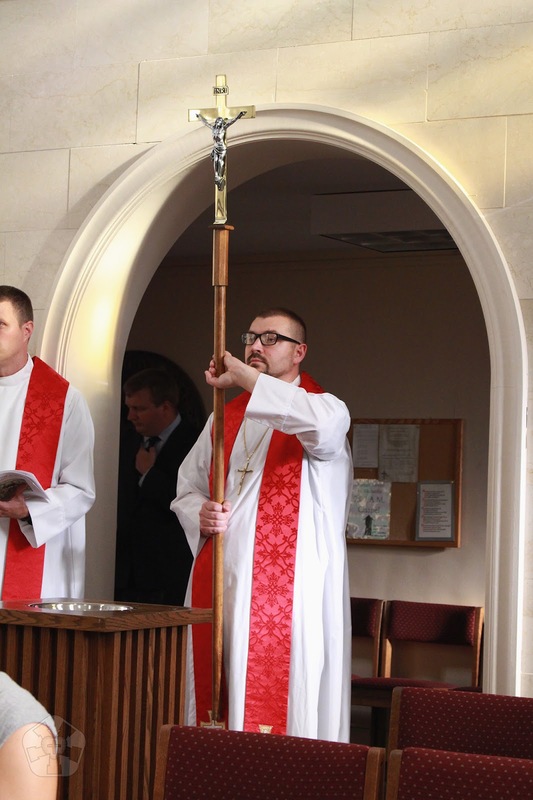 At its heart, it really is the congregation that carries Lutheran worship. With only about 40 voices and a fine organist, we filled the chapel with God’s praises. Because we had a 10-hour drive to Nebraska ahead of us, my ride decided to head out after lunch, so unfortunately we missed the closing service. From the service folder, it looks to have been as good as the opening service. The intent behind having the closing service after lunch is so that the last thing attendees would receive before heading home would be the Lord’s Supper. I think that’s a wonderful goal, and one I don’t wish to diminish. Hopefully there’s a way in the future to still end with the Sacrament and wrap up the conference by noon on Friday to accommodate travel time. The one-hour meal slots provided a good opportunity to get to know our fellow conference-goers and chew on the material presented during the sessions. There was also about two hours of free time each evening before Compline. We enjoyed games, discussion, and fellowship each evening. Again, the strength of having a small group was getting to pick the brains of the presenters. Compared to worship conferences with over 1,000 attendees, you would never get that chance. At the end of the 4th day, most of the attendees were on a first-name basis with the others. This was totally unique to my experience. Mountaintop experiences are important. I still count the worship conferences I’ve attended as high points in my journey towards heaven. But if we just attend these occasional worship events in order to achieve an emotional high, then the rest of our lives will feel like drudgery. It’s not about escapism. 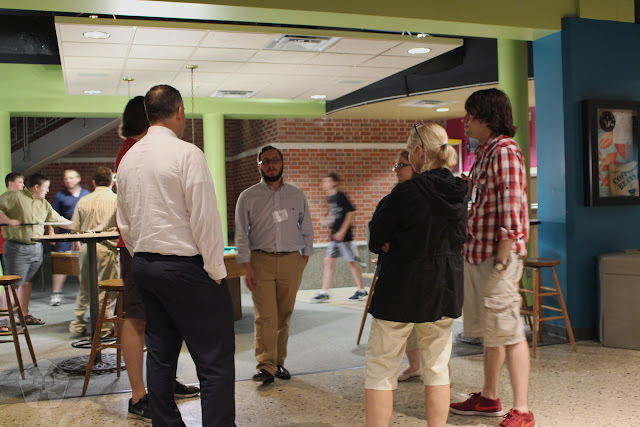 I think I’ll look back on this first Return to Wittenberg conference fondly, and I hope many more will follow. But the beauty of R2W is that it focused on the daily life of the Christian in a way that nothing else I’ve seen has done. It didn’t feel like an escape from the daily grind as much as it was a recharging station. Christians talk a lot about “relevance” these days, but I doubt many are looking for it in the catechism, or in the sacraments. But arguably there is nothing more relevant or necessary. I think it's safe to say that Return to Wittenberg is going to stick around. Look for it again next summer, and tell your congregation. Anyone is welcome to come. What's the greatest obstacle to change and renewal in the Church? Lutherans are a mixed bag these days, but most of the time I presume political gridlock isn't to blame so much as apathy. (And perhaps "apathy" isn't the right word. Sometimes it seems almost like a militant adherence to the status quo.) Speaking from my experience, I don't know how many times in the past several years "I've never heard any complaints" was given as a reason not to change something. Its close relatives are: "We've always done it this way," and "If it ain't broke, don't fix it." It perplexes me to some degree. If I can find someone who is willing to voice some complaint, or at least suggest that improvements could be made, then will you consider changing? What if, like good Lutherans, we're just keeping our opinions to ourselves? Mother always said, "If you don't have anything nice to say..."
The same old argument came out of the bag recently in regard to commissioning artwork to commemorate the 500th anniversary of the Reformation. It's happened often enough to at least give me pause. Is there something to it? 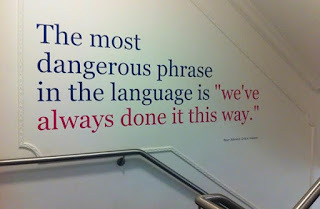 Are there times when the status quo is to be honored above change? If I can understand the mindset, maybe that will help me to overcome the rigid apathy. I consider myself a traditionalist, so in that regard it's somewhat odd that I so often find myself on the side of change. On the one hand, I thank God that my church is a conservative Lutheran congregation. We don't have battles over praise bands, trendy youth programs, or licentious pastors. I think my church is pretty normal among the WELS in that regard. On the other hand, probably like many WELS churches, we sometimes confuse the status quo for "tradition." They aren't necessarily the same. The traditions of the Church (e.g., the liturgy) were established long ago and for good reasons (e.g. maintaining good order, preaching the gospel, aiding learning). Those reasons still stand. The interesting thing about the traditions of the Church is that even while they remain, they change. What served as the liturgy in the Byzantine Empire won't work for 21st century American Lutherans in Seward, Nebraska. But we still have a liturgy, and we probably sing some of the same biblical canticles that Justinian sang—only they've been translated into English and set to different music with different instruments. The clergy that served in Hagia Sophia would have worn albs, just like our pastor. But their vesture would have seemed distinctly Roman and somewhat alien to us. Traditions in the church are commended by the Book of Concord as being good and useful, but they change. Aside from regional and cultural changes that occur when Christianity is transmitted around the world, Christians have deliberately and often improved the tradition. This is why Romanesque churches eventually gave way to Gothic—many Europeans thought that pointed vaults, stained glass windows, more light, and greater verticality resulted in a more beautiful and fitting setting for worship. Note: These weren't radical changes—they occurred slowly over hundreds of years, and maintained the same basic layout of churches past. Also Note: There was nothing wrong with the previous style. When Constantine first made Christianity legal, Christians who had worshipped well enough in house-churches didn't remain there; they began building large basilica-churches. Likewise, the Gothic style didn't come about because parishioners complained that they didn't like rounded arches. In both cases, church architecture changed because Christians with artistic sensibilities saw room for improvement. Jump forward to 1517. Martin Luther reformed many of the traditions of the Catholic Church. One notable example was that he excised the Canon of the Mass from the liturgy. 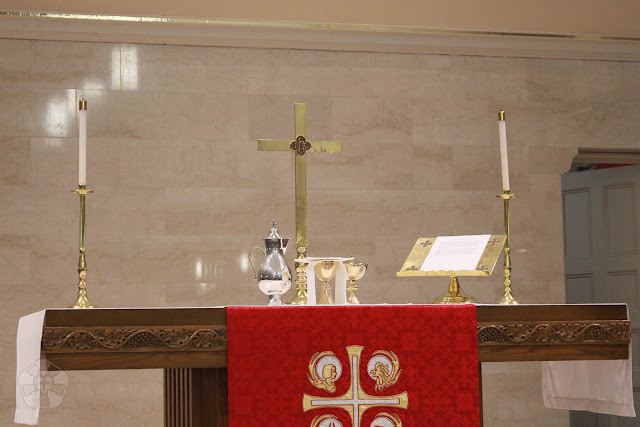 The original reasons for having the liturgy still remained—but the Canon hindered them. It turned the Sacrament of the Eucharist into a sacrifice, thus denying the once-for-all sacrifice of Christ and obscuring the essence of the gospel. This is an example of a change that was not only an improvement, but a necessity. Luther should serve as a good example for us even in the 21st century. Contrary to the beliefs of some, the Reformation was not a one-time event. The Word and its pure teaching must constantly be guarded; the Church must undergo constant reform and renewal. Our resistance to change is understandable, given how highly Lutherans value their heritage, and given the many pressures within the church to conform to an increasingly godless culture. But we can become so wary of negative changes that we fear any change. I see that attitude in myself often enough. Change is not the enemy of the Church. Bad changes are the enemy. Good changes are the work of the Holy Spirit. 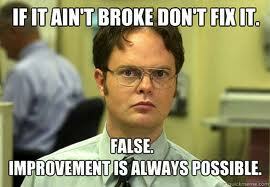 It may sound like a corny corporate policy, but Meme Dwight is right: improvement is always possible. Of course, the Church doesn't change for the sake of change. We search the scriptures and test the spirits. We want to make sure: first, that there are good reasons to change; and second, that the change will actually be an improvement before we implement it. 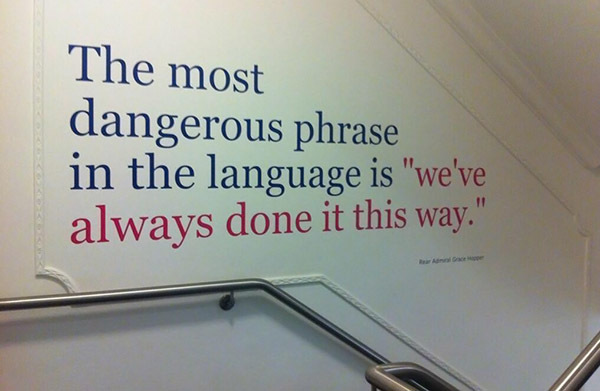 We should always resist bad changes. And for that reason, we can find cause to commend at least some of our Lutheran stubbornness. But if Lutherans are not open to change of any kind, then we're not open to improvement, either. And that, I think, is not a tenable position for a Christian to have. The following was written as a feature article for Lutheran Forum, an independent theological quarterly for clergy and laity, with contributing authors from the ELCA and LCMS. It will appear in the spring 2016 edition. It may seem cliché, but it was like being on a different planet. I stood underneath the massive dome of Sta. Maria del Fiore in Florence, gazing up at one of the greatest engineering feats of the last two millennia. I marveled at the scale of Vassari’s "Last Judgment" fresco, which covered the dome’s interior. The cavernous void between the vaults and the smooth marble floors was enough to induce vertigo. The whispers of awed visitors carried through the space with crystal clarity. I wondered, why was this place of worship so completely alien to the experience of an American Lutheran? rom the rural American landscape—it was a burning bush experience. It’s hard to imagine seeing works by Giotto, Michelangelo, Raphael, and Carravagio, and not being utterly transformed by them. They are beautiful, to be sure. And for a student of art history, visiting Florence is like making a pilgrimage to the Holy Land. But gazing at those old masterpieces, I felt the uncanny urge to remove my sandals for a different reason. They weren’t just individual “expressions” of faith—they were more akin to a divine collaboration. God was indeed present there, in more ways than one. I wanted to make art like that. I wanted to roll up my sleeves and produce the kind of work that would transform a bland, Lutheran landscape into the kind of sublimely spiritual experience that Europeans had produced more than 500 years ago. But first I would have to make Lutherans want it. They seem to be happy with the status quo: white walls, plain glass, a steep roofline and a couple of empty crosses. 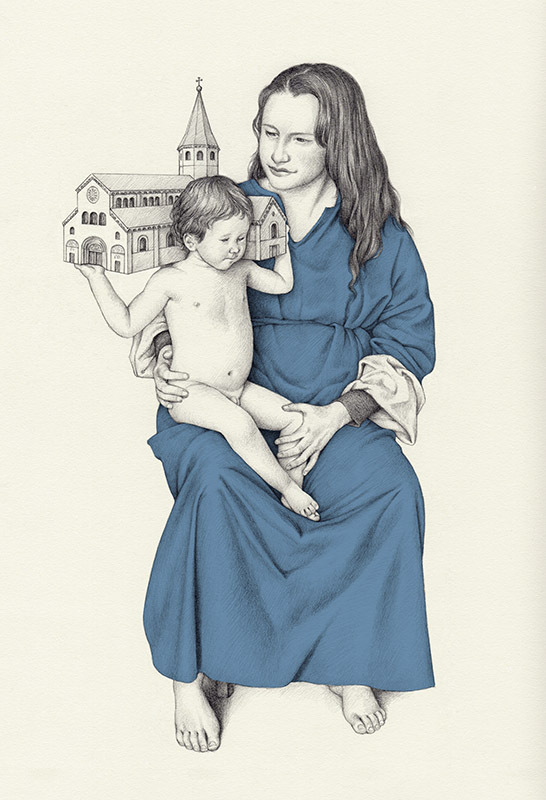 Why had the visual arts, which once had flourished in the Lutheran church, almost disappeared? Whatever the reason, I was resolved to remedy it. Since that hallowed Italian experience, I’ve come to understand my own artistic vocation much more deeply. It didn’t come to me in a flash of inspiration in the Duomo. It came by reading Holy Scripture, by the instruction of wise mentors, by reading the works of studied men of faith, and by personal experience. The Word of God is always the best place to begin and end. For many years, I was ignorant of this passage from scripture (if I had read it before, I had probably glossed over it as many do with those tedious Levitical laws): “Then the LORD said to Moses, ‘See, I have called by name Bezalel son of Uri... and I have filled him with the Spirit of God, with ability and intelligence, with knowledge and all craftsmanship, to devise artistic designs, to work in gold, silver, and bronze... And I have given to all able men ability, that they may make all that I have commanded you’” (Exodus 31:1-4,6). God called Bezalel by name. For any artist struggling with whether or not art can be a “legitimate” vocation, the answer is there in holy writ. Add to it that Bezalel is the first person in the Bible of whom it is said that one was “filled with the Spirit of God.” If that doesn’t light a fire under you, what will? Unfortunately for me, Bezalel wasn’t on my radar in graduate school, and I was deeply conflicted. I was attending a secular school for the first time in my life, because I felt this need to make my artistic abilities into something “productive” for a career. I found myself suppressing my desire to make overtly Christian works of art. On some level, I didn’t want to face criticism from my faculty and peers of various faiths. I never denied my Christian faith, but I was trying to compartmentalize my faith life and my vocation. It took a devout Catholic mentor to talk some sense into me. James Langley is a liturgical artist working and teaching in Savannah, Georgia. I interned with him as a studio assistant, where he saw in me a suppressed desire to make sacred art. He nurtured that spark, and advised me to do my Master’s thesis on resurrecting liturgical art. The paper practically wrote itself, and to my surprise, my faculty advisers were thrilled with it. In time, I realized that Langley was the latest in a long line of teachers, mentors, and family members who had been gently encouraging me in this direction from my childhood. I finally grabbed it by the horns. As it turns out, fulfilling one’s vocation is not as simple as just accepting it as a reality. It took a good deal of wrestling with disappointments—one after the other. I did manage to get a teaching job at a Lutheran college shortly after graduate school, but rewarding though it was, it wasn’t the “big break” I was hoping for. I kept at it, working part-time jobs, pushing mops and doing whatever it took to pay the rent. With a wife and kids, I was less willing or able to put everything on the line to go and chase that dream job—even if it is the one I thought God wanted me to have. Things just seemed stagnant. Had I not paid my dues? I kept asking myself. Then I would mentally slap myself. You don’t earn God’s grace. “It is the gift of God, not of works, lest anyone should boast” (Eph. 2:8,9). Be patient. God knows best. My parents had recommended Gene Edward Veith’s God at Work: Your Christian Vocation in All of Life to me. When I read it, it was my second big wake-up call. It opened my eyes to my other vocations—in the home, as a husband and father; at my workplaces, as an employee; and as a Christian, to my church, and to everyone around me. Whether or not I was making a living with my artwork, I had opportunities to show Christ’s love to countless people. I had no right to despise those everyday vocations simply because they were not the one vocation I felt most passionate about. This helped to take the anxiety out of waiting for something big to happen. When the fog of self-pity had cleared, it allowed me to see that God was working small things for my good all the time—and my business was steadily growing. Every year I was getting more clients, more opportunities, and more exposure. Realizing that vocation is not about finding the right “career” is incredibly liberating. It’s about serving God and one’s neighbor; it’s about providing for one’s family. How could I do all of those things, while exercising my unique gifts? That’s what vocation is about. Vocation is always in the present. When I saw a need that could be filled, I filled it. I started designing logos for Lutheran churches. I started teaching for Wittenberg Academy, an online Lutheran high school. I started creating church banner designs that have theological depth and artistic integrity. I even did a smattering of web design projects. Sure, those jobs are less glamorous than making an altar painting for a cathedral or being a consultant for an extensive church renovation project, but they are rewarding in their own right. I get to mold young minds with a Lutheran understanding of the arts. I get to help churches make a visual confession about who they are and what they teach. And most importantly, I have the joyous privilege of helping people focus their eyes and hearts on what God has done for us in Christ Jesus. It’s all about Jesus. Christ lived for me. Christ died for me. Christ rose for me. If ever our work becomes about us, it will seem like drudgery. Worse, it muddies the water instead of clearly proclaiming Christ. When I paint for the church, I don’t set out to express myself. What inspired such awe in me when viewing the works of the old masters is that however great the artist’s talent, the work was most powerful when it was subordinated to Christ and his Word. It was as if God’s hand was moving in tandem with the artist’s, in order to show his love to generations of viewers. The painting or sculpture becomes a kind of veil behind which we can glimpse a portion of God’s glory, his artistry, and his reckless love for mankind. It’s humbling to think that God may choose to use my brush, my hands, to accomplish that. As I said before, the Word is a good place to begin and end. “And let us run with perseverance the race marked out for us, fixing our eyes on Jesus, the author and perfecter of our faith. For the joy set before him he endured the cross, scorning its shame, and sat down at the right hand of the throne of God.” (Heb. 12:1-2). Perseverance sums up the Christian life pretty well. Don’t expect glamor and riches and fame. Fix your eyes on Jesus. Run the race. Remember that Christ has already won it for you—and Christ himself is the prize.